My penultimate day in Alabama was spent with a home care team who delivered services to elders in a rural community. Before team members had breakfast together, they held hands and said prayers of thanksgiving. ‘Faith’, as I’ve found throughout my stay in the South, is unapologetically and wholeheartedly embraced. The occupational therapist I shadowed had an excellent rapport with those she visited – including Mr S – and was thoughtful about the everyday ethical issues she came across: elders reluctant to be discharged when they were assessed as not needing home care services; those who live with family whose lifestyles do not make for a healthy environment; and elders who are lonely, wanting company more than the assistance with activities of daily living the OT feels they need. 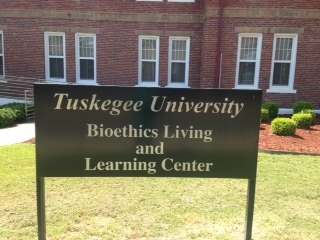 I am privileged to have been a Fulbright Scholar-in-Residence and was sad to leave Tuskegee University this week. I am confident that collaboration will develop and friendships made will endure. ‘Black’ is complicated – I talked with Black people brought up in the US and with those who came to the US from countries such as Ghana, Nigeria, the UK and the Caribbean – all had different perspectives on Black history and what follows from it. ‘Church’ is diverse and deeply embedded in everyday life in the South – there are, for example, about 200 denominations in the Southern Baptist Convention (see https://southernspaces.org/2004/overview-religion-and-us-south. I witnessed the solidarity, respect and generosity demonstrated in Church and in everyday life. I was also challenged by views and practices that were not respectful of difference. Stories illuminate intersecting identities – There is much value in inviting and listening to stories so we understand our differences and similarities and how unique identities impact on individuals ability to flourish. A pluralist bioethics is the best fit for cross-cultural exploration – historical and cultural contexts impact on bioethical questions and perspectives. In the spirit of the Fulbright vision, we need to be open-minded and not assume that one perspective will suit all. ‘They say football’s a matter of life and death – but it’s more important than that’. I visited Montgomery the weekend local university Auburn was playing Alabama. The city was deserted as some 100,000 people had descended on Auburn for the game. Football, I was told, is another Southern religion. My encounter with Mr S brought into sharp focus a very challenging aspect of Southern culture: gun control. I met Mr S when I was shadowing the OT. He told me his handgun was loaded and that he kept another by his armchair. What does ‘gun control’ have to do with care ethics? I’m currently working on a Nursing Ethics Editorial on this theme with a Tuskegee colleague, Dr David Hodge. We’ll be pleased to consider your responses as we write this. Next week I will tell about my time at the Kennedy Institute in Georgetown. Washington.